Learn Chimera commands that are useful for movie making. 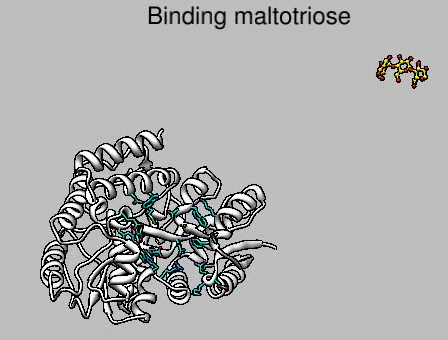 Open maltotriose binding protein and make it look good. Note: default playback speed is 25 frames per second. Cut out initial/final segments with no motion. 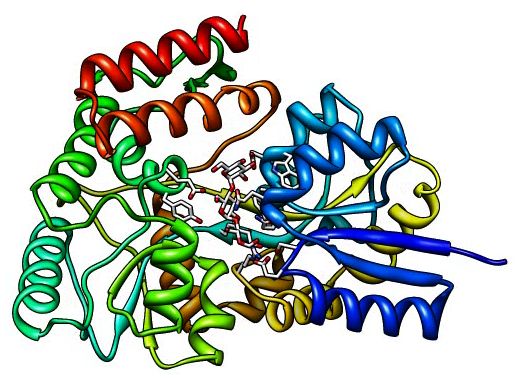 Rock instead of spin to emphasize bound ligand. Improving the movie appearance. 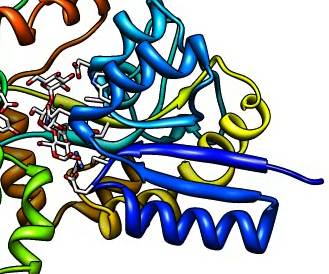 Spin centered on the maltriose ligand. Open script m4.cmd to record movie. Improve rendering quality. Increase movie bitrate. Use "movie encode bitrate 10000" in script m5.cmd, default bitrate 2000 Kbits / sec. Movie file size will increase proportional to bitrate. To avoid final frame of movie looking bad, add 10 stationary frames at end. Reduce jagged edges. Use supersampling. 9 times slower recording movie. Raytraced rendering to produce shadows. Very slow recording movie. Time depends on scene complexity and window size. 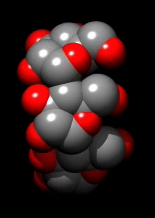 Make window size small and only show ligand as spheres for example. 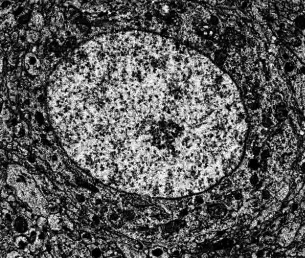 Movie showing sections of rat cortex from electron microscopy. Move volume dialog Plane slider. Open script r1.cmd to record movie. Or go to Chimera web site (google Chimera), click Command Index link at left. Documentation for the movie command links to other useful commands. Commands do not exist for all Chimera capabilities (for example, Morph Map). Animation gallery at Chimera web site has example animations. Morphing between atomic models. 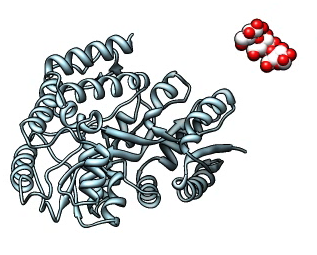 NMR ensemble of RNA stem loop that convinces ribosomes to translate viral RNA without methylguanosine mRNA cap. 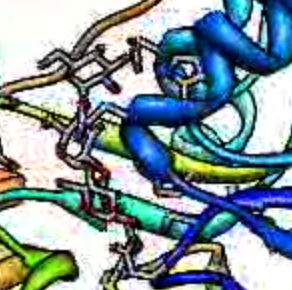 Molecular dynamics trajectories. 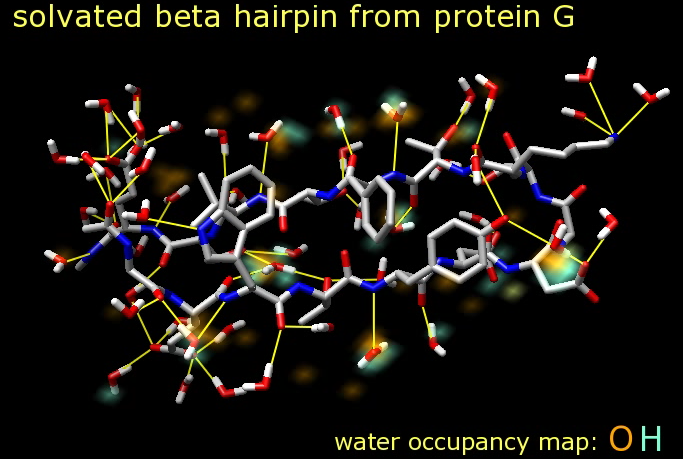 Beta hairpin of G protein with hydrogen bonds identified at each frame of trajectory. Morphing between two maps. 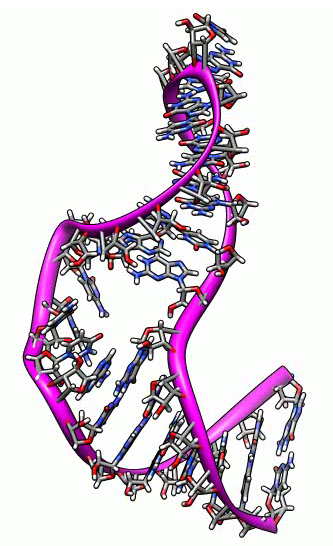 RNA polymerase in two conformations. More examples from Chimera animation gallery. Chimera makes only simple animations. Here is a movie made using Autodesk Maya commercial animation software with data exported from Chimera. 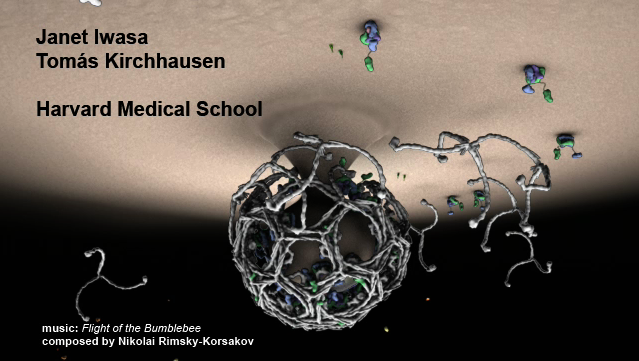 Clathrin cage assembly by Janet Iwasa, Harvard Medical School. Example Chimera movie with several stages. Movie mbp.mov made with script mbp.cmd. Tools / Utilities / 2D Labels, click in graphics window and type text. Command version 2dlabel allows fading labels. 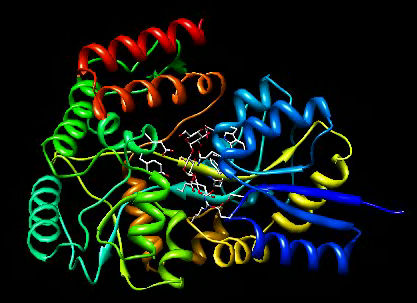 Making the maltotriose ligand fly. Active models, turn off #1 with checkbutton below command-line. 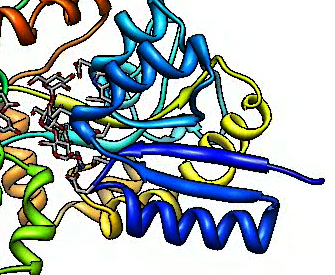 Move ligand to upper right with mouse and rotate. 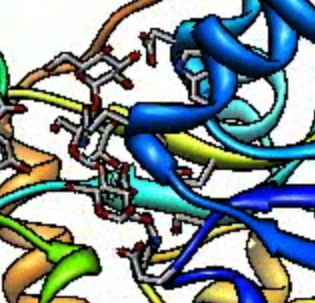 Command script f1.cmd for flying ligand f1.mov. 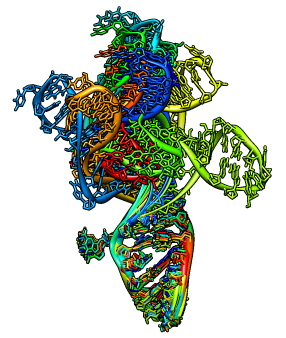 Use the morph conformations tool to show different configurations of the HIV packaging signal, RNA stem loop 1 (pdb 1m5l). all 15 models, press Add. Then choose first model, and press Add. This makes morph loop back to starting conformation. Morph dialog, set Action on Create to "hide conformations". MD Movie dialog will appear, press play button (triangle pointing right). 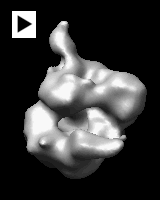 Command script 1m5l.cmd for RNA morph 1m5l.mov.